We are at 35 rue des Belles Feuilles 75116 Paris. The shop is conveniently located just 500 yards from Trocadero and less than 1 mile from the Arc de Triomphe. After your visit you can carry on shopping at the other high quality food shops in the same street – fishmongers, butchers, bakers, etc. We are easy to reach by public transport. 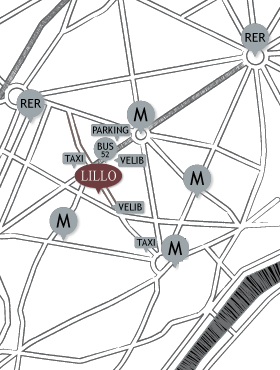 Accessing Maison Lillo is very easy (BUS - ligne 52 ; METRO - Victor Hugo, Pompe, Trocadéro ; VÉLIB' - You can access it through all kinds of transportation http://www.velib.paris.fr ; TAXIS located avenue Victor Hugo ; PARKING space located close to avenue Victor Hugo).